64th Brandywine Timberwolf scouts deliver bird boxes to the Ashland Nature Center. (L-R): Alycia Alford, Nate Hontz, Eoin Mitchell, Hadyn Wiseman-Null, Lily Martin, Zack Swager, Sebastian Seavey, Henry Grimme, and Jill Chase. Not pictured: Ronnie Bednarz and Camayo Ochola. HOCKESSIN, DE – March 20, 2017 – This weekend, Timberwolf scouts from the 64th Brandywine Baden-Powell Service Association (BPSA) delivered 17 handmade cavity nesting boxes to the Delaware Nature Society’s Ashland Nature Center. The nesting boxes were built by the scouts over the winter months, while they learned about native birds for their Conservationist Badge. The nesting boxes were constructed of cedar, using as a “simple one-plank design,” with a swinging door for monitoring and cleaning. The boxes are appropriate for bluebirds, tree swallows, black-capped chickadees, and other small songbirds. Joe Sebastiani, Ashland Nature Center Manager, plans to install them in the future at Ashland or another appropriate location. The 64th Brandywine is a chartered group of the BPSA serving south Chester County, PA. Scouts in the Timberwolf section are aged 8-10 years, in grades 3-5. The BPSA was formed in the U.S. in 2006 as a co-ed, inclusive, secular and traditional-style Scouting association. The association continues the principles and practices of Scouting laid down by Robert Baden-Powell in 1907. The BPSA is not affiliated with either the Boy Scouts of America or the Girls Scouts of the USA; the BPSA is a member of the World Federation of Independent Scouts (WFIS). 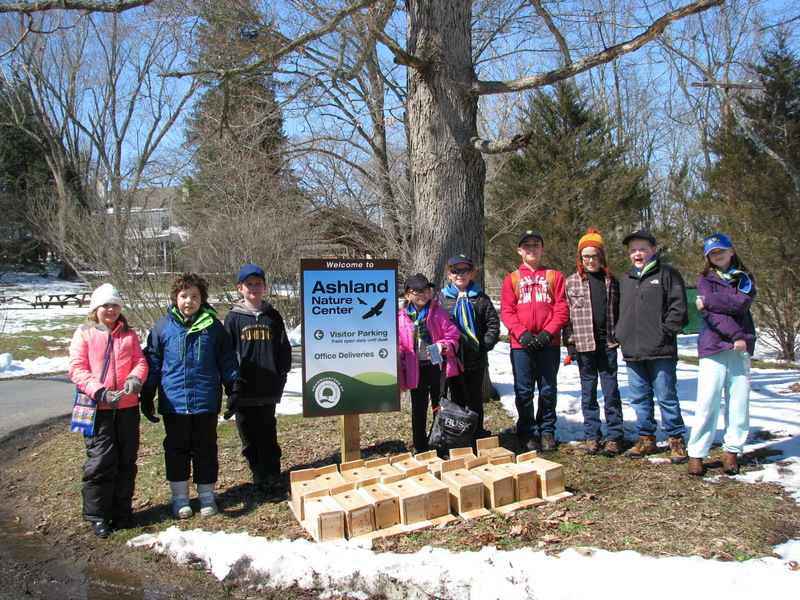 CAPTION: 64th Brandywine Timberwolf scouts deliver bird boxes to the Ashland Nature Center. (L-R): Alycia Alford, Nate Hontz, Eoin Mitchell, Hadyn Wiseman-Null, Lily Martin, Zack Swager, Sebastian Seavey, Henry Grimme, and Jill Chase. Not pictured: Ronnie Bednarz and Camayo Ochola.